Hope Is Real! 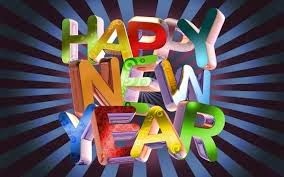 : Happy New Year's - Look Forward to Adventure! Happy New Year's - Look Forward to Adventure! The icky in-between time between Christmas and New Year's is over and we can now look forward to achieving new hopes and dreams this year, which is such a relief-I hate those in-between days! There are only five days in between Christmas and New Year’s, but they seem like five months-the non-normative schedule, the boredom, the way the mind cannot help but perseverate over the last year’s heartaches and regrets… I told my therapist on Monday (the day before New Year’s Eve) that I had had a lot of losses that year and she reframed it as situations and people that I outgrew and I like that framing much better. It’s true-last year was the year of intense spiritual, emotional, and mental growth for me, as I set major boundaries with people and places. The year started out slow and frustrating, as the year often does for me. I had a great birthday party in May and then I ended up leaving a job, a really good friend and my beloved church community, because they had all become too stressful for me. I still communicate with them a little, but those three things have been a monumental adjustment and to be honest, I’m still adjusting. Fortunately, I recognized that I needed help in dealing with these big decisions and decided to retake my therapist’s Dialectical Behavioral Therapy class, which has helped me immensely. I am doing well now-really well! So well, in fact, that in October my therapist and I came to the conclusion that I no longer fit the diagnosis of Borderline PersonalityDisorder!!! Fabulous! Back up to September, when I attended DragonCon, the world’s largest sci-fi and fantasy convention in Atlanta-it was my first time doingcosplay and I had gotten a costume designer (cheater, I know!) to create Merida’s archery dress for me. Little girls and boys worshipped the ground I walked on and I had a blast, although I sometimes worried that my massive wig would strangle me! I have found another church that I like a lot, called Kirkwood United Church of Christ. I had never heard of that denomination before a friend recommended it to me recently, but it’s very progressive and gay-friendly, and so far I have liked everything I have researched about it. The church I attend is very welcoming, with a bluegrass band. (Bluegrass seems to be really popular right now-it was even popular at DragonCon this year!) I participated in their Christmas choir and have been their pianist a few times during worship and it feels really good to contribute and fellowship in soulful worship. I have desperately missed that connection. I took an art therapy class, which was incredibly healing and helpful. I started the year by making a collage where I celebrated the fact that I am now older than Sylvia Plath-an accomplishment that I used to worry that I would not accomplish. I then made a boundary protector dragon I named Gertrude, who helped me keep me strong during my time of deep stress. 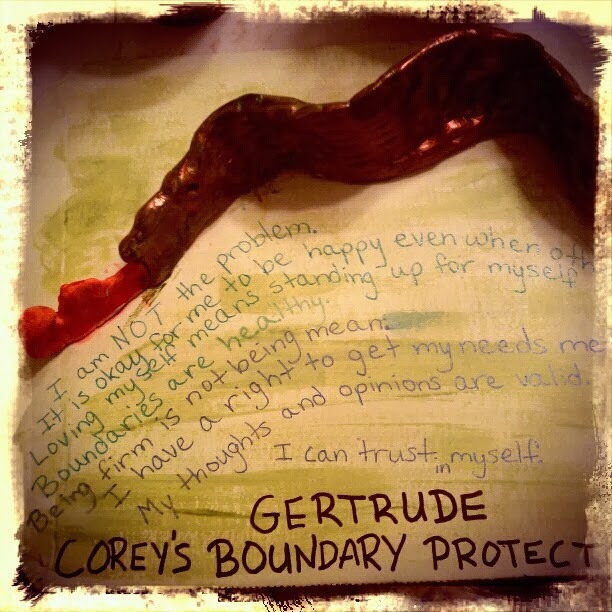 Right now I am in the middle of creating an altered book I call, “Corey’s Book of Truths,” and it is a hardback book in which I have altered the pages and have written and decorated my own set of positive affirmations. As I write the affirmations, they become like a prayer that is written indelibly on my mind, mixed with the power of the Holy Spirit, filled with wisdom and strength. In the end, I decided to end the class for now, but I am continuing to do the art on my own. I felt very appreciated and loved. We then watched the 1970s classic, Free to Be You and Me, which fostered some great discussion and laughs. I hope that we do some more social meetups in the next year. 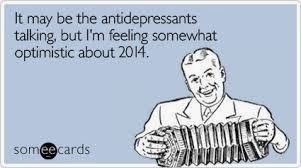 I have some great things to look forward to in 2014! I learned that out of great heartache comes great growth and opportunities if you have the faith to follow what your wise mind is telling you to do. A good friend of mine and I have longed for feminist Biblical and theological discussion and so have set up a meetup on meetup.com called Feminist Biblical Explorers. It starts on January 12th and we have put an immense amount of work into it. We already have eight people RSVP’ed for the first meeting, which is both exciting and anxiety-making. On Tuesday, the 7th, I will start a new volunteer job at another nursing home where I will play and sing big band songs. I already do this at one place, but I want to do this type of thing more often. It is an activity that I enjoy and I hope that it will lead to some connections-maybe even a job at a nursing home one day. My new church (KUCC) will start its choir up again for the liturgical season of Lent and I will join it for that, which I know I will enjoy. I am particularly looking forward to joining it then, because I really do not enjoy that season very much. I usually find the season of Lent to be very depressing and always semi-seriously consider taking a vacation from church during that time-participating in choir will give me a positive reason to stay connected and keep me spiritually fed in church during that month and a half. Lastly, hopefully I will be done with my altered book by the spring, so that I can enter it into my county’s public library’s annual altered book contest! I don’t expect to win, but they display all the entries and I think it will be way cool to see my book on display and perhaps it will provide some inspiration to someone else. Whew! So much heartache, but so much growth! And so much more expected growth and hope in the coming year! I hope you will continue to journey with me through this year with me and that my ramblings provide some sort of inspiration and hope. Let us learn from the past, look forward with eagerness and adventure, and enjoy the present as best you can. Don’t forget that you can now follow me at Hope is Real On facebook! it's the mindfulness i gotta work on. matters to me and i'm grateful they're here. If respect is my one non-negotiable for how people treat me, it also has to be my one non-negotiable for how I treat other people. “Babies Ruin Bodies” An Ode to my Postpartum Body. I'm Smashing the Scale this year because I've recently had a revelation, its not okay to hate yourself.